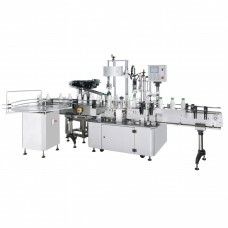 This Automatic Bottle Capping Machine is designed to handle Plastic Screw Cap, Flex Band Cap and Press-on Cap. ● Auto Capping Machine construction is made by SUS# 304 and aluminum alloy. ● Mitsubishi PLC Control System with digital touch screen. ● Pick & Place device for placing the cap onto bottle mouth automatically. ● Pick & Place is driven by servo motor with rotary actuator. ● One capping Head (for one size only) is driven by servo motor with electrical cylinder. ● Auto cap feeder with caps vibrating bowl and cap chute for one size only. ● Cap chute with photo sensor, machine will stop automatically while no cap. ● Fast changeover device and easy machine clearing. ● Bottle star-wheel for 2nd size of bottle size. ● Vibratory bowl and cap chute for 2nd size of cap. ● Capping head for 2nd size of cap. ● Cap gripper for 2nd size of cap. ● Cap hopper with elevator conveyor for supplying caps into cap sorter. ● Safety cover for protecting the operator during capping.